Misguided doctors or marketing agents? 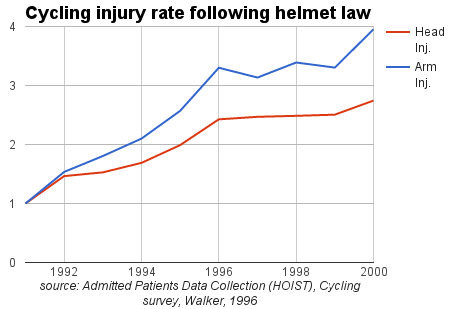 Why did the injury rate triple after the helmet law? Has the helmet law improved safety? Can helmets cause permanent disability? My helmet saved my life! Do helmets really protect racing cyclists? After the helmet law, the risk of accidents doubled. The risk of death & serious injury for child cyclists increased by 50%. 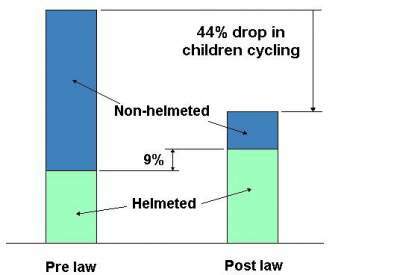 A noticeable impact of the helmet law has been to reduce cycling. Almost half stopped cycling, while only 9% put on a helmet. There were 30 to 40% fewer cyclists. The risk must be adjusted per cyclist. 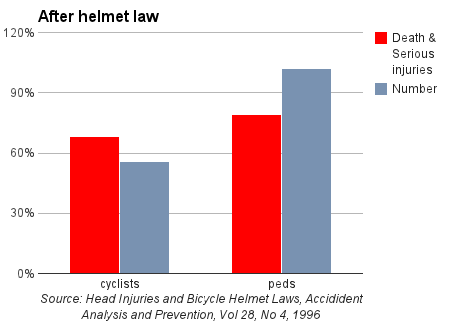 The helmet law was introduced at the same time as other road safety measures. To isolate the impact of the helmet law, cycling safety must be compared with pedestrian safety. Those studies attribute all apparent improvements to helmets, without considering confounding factors. After adjusting for those factors, the decline in head injuries vanishes. [the] governments [which introduced the helmet laws] do not like to admit they’ve made mistakes”. More importantly, risks per cyclist seem to have increased, compared to what would have been expected without the law, implying that helmet laws are counter-productive. Possible explanations include risk compensation, reduced ‘Safety in Numbers’ and that brain damage is predominantly due to rotational injury. the risk of death and serious injuries increased by 21% for child cyclists . the risk of death and serious injuries decreased by 21% for child pedestrians. Cycling injuries decreased less than the reduction in number of cyclists. This may be due to risk compensation. Risk compensation is the tendency to take more risks when wearing safety equipment. Lured by a false sense of safety, helmeted cyclists have more accidents. Even cyclists who discount the daredevil effect admit that they may ride faster on more dangerous streets when they are wearing their helmets. A 1989 study found that helmet wearers were 7 times more likely to have accidents. Both the behaviour of the helmeted cyclist and surrounding motorists increases the risk of accidents. A key factor for cycling safety is the number of cyclists. This is “safety in numbers”. With fewer cyclists, cycling becomes more dangerous. According to “safety in numbers”, a 44% decline in cycling increases the risk of accidents by 41%. A 9% increase in helmet wearing cannot compensate for a 41% increase in accidents. 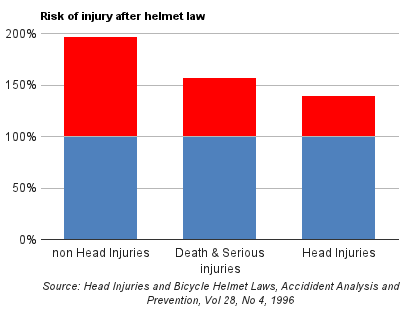 The helmet law has increased the risk of injury by increasing the risk of accident. Evidence of an increase in accidents can be seen in Table 2 on Page 465 of the report. The risk of non-head injuries doubled, indicating that the risk of accidents doubled. The risk of accident almost doubled. The risk of death & serious injury increased by 57%. This is similar to what was observed for children and adults, where the risk of injury tripled. Cycling has become more dangerous after the helmet law. 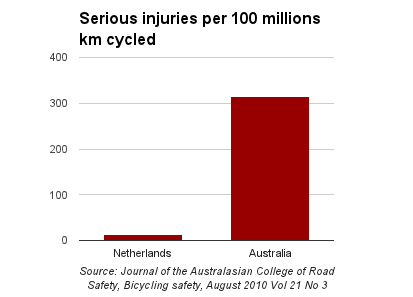 In Australia, the cyclist fatality rate is now five times greater than in the Netherlands. The serious injury rate is 22 TIMES greater. The fatality rate per commuter cyclist is 27 times higher in Sydney, Australia than in Copenhagen, Denmark. 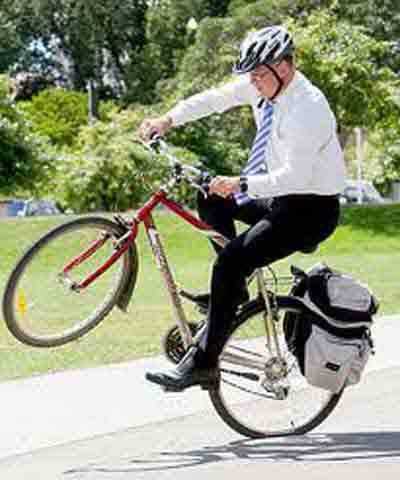 New Zealand introduced a bicycle helmet law in 1994. In a cycling safety perception survey, 83% report that cycling has become more dangerous. Rodgers, G.B., Reducing bicycle accidents: a reevaluation of the impacts of the CPSC bicycle standard and helmet use, Journal of Products Liability, 11, pp. 307-317, 1988. No wonder almost no other countries have followed Australia’s “lead” after more than 20 years. Reducing cycling while increasing the risk of accidents is not a great outcome. What a poor example Australia has set.